RANCHO MIRAGE, Calif. -- Lexi Thompson had no idea why LPGA Tour rules official Sue Witters was approaching her on the way to the 13th tee at the ANA Inspiration. When she found out, Thompson still couldn't believe it. A television viewer's email had alerted officials to a day-old rules violation by Thompson for a 1-inch ball placement error . Her three-shot lead had just been wiped out by a four-shot penalty. "Is this a joke?" Thompson asked Witters. After being assured it wasn't, she responded: "This is ridiculous." Thompson survived the shock and tears, and she forced a playoff with three gutsy birdies that had the Dinah Shore Course crowd on its feet. But So Yeon Ryu managed to take advantage of the break created by Thompson's extraordinary penalty. Ryu birdied the playoff hole to win the LPGA Tour's first major of the year Sunday after Thompson was blindsided for an infraction she had accidentally committed 24 hours earlier. 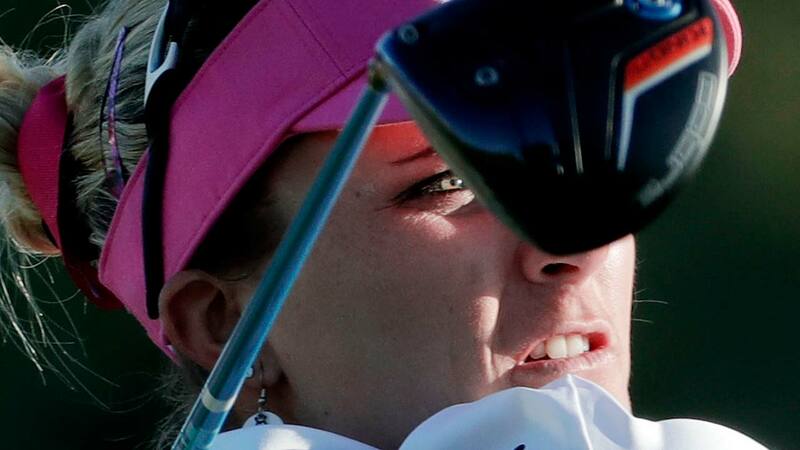 Thompson found out she had been assessed a four-stroke penalty for a rules violation Saturday. Thompson had a chance to win the tourney on 18, but left an eagle putt an inch short. Thompson, the 22-year-old U.S. Olympian who won here in 2014, was left stunned by the decision that stopped her from cruising to what looked like an easy victory. The ruling cost her more than a strong chance at her second major title: Ryu won $405,000 with the victory, and Thompson went home with just over $250,000 in second place. "Every day is a learning process," said Thompson, who still stopped to sign dozens of autographs after her heartbreak. "I wasn't expecting what happened today, but ... it happens, and I'll learn from it and hopefully do better." The fateful email arrived during Sunday's final round, alerting officials to the violation committed Saturday. Thompson marked a 1-foot putt with a coin on the 17th green during her third round, but she replaced the ball perhaps 1 inch out of position. After an extensive video review , Thompson was penalized two strokes for an incorrect ball placement and two strokes for an incorrect scorecard. Witters regretfully explained the penalty to Thompson. "I can't go to bed tonight knowing I let a rule slide," Witters said. "It's a hard thing to do, and it made me sick, to be honest with you." Thompson fought back tears after getting the news, but she incredibly birdied the 13th hole. She battled back into a five-way tie for the lead, making three birdies and a bogey on the final six holes of regulation at Mission Hills Country Club. "It's unfortunate what happened," Thompson said. "I did not mean that at all. I didn't realize I did that. I felt strong through the finish, and it was great to see the fans behind me." Golf fans on the course and the internet reacted with bewilderment and outrage when the LPGA's decision became understood. Tiger Woods immediately came to Thompson's defense on Twitter. "Viewers at home should not be officials wearing stripes," Woods wrote . "Let's go Lexi, win this thing anyway." Most golfersweighing inon Twitter didn't disagree with the ruling, but condemned the practice of allowing TV viewers to have their say - particularly an entire day afterward. Even Justin Timberlake saw it : "Lexi is SO CLASSY. Handled that with grace and fight. Career defining moment." As awkward as the situation was, it could have been worse: If golf officials hadn't made a rule change before last year, Thompson would have been disqualified entirely. 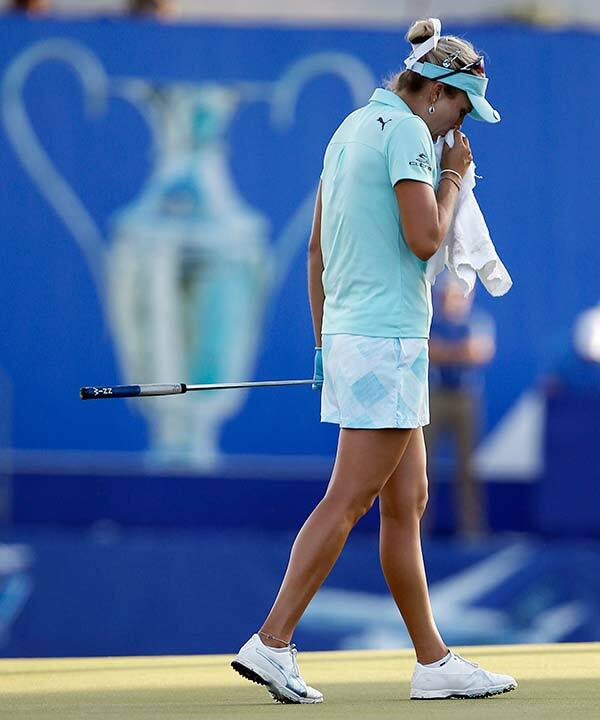 Ryu birdied the 18th hole in regulation and again in the playoff, but she didn't find out she was in serious contention to win until officials informed her of Thompson's penalty on the 16th tee. "I just cannot believe the situation," Ryu said. "I didn't even check the leaderboard. I thought Lexi played really, really well. I didn't expect what happened to Lexi. "It's a very unfortunate situation. I didn't expect it. I thought I'm well behind, so all I wanted to do was play my game." They both finished regulation at 14-under 274, but Thompson still nearly won it in regulation after crushing her approach shot on the 18th. With emotions visible on her face amid loud chants of her name, Thompson gathered herself - and left a 15-foot winning eagle putt inches short. Ryu, who also won the 2011 U.S. Women's Open in a playoff, buried a 5-foot birdie putt to claim her second major title with an excellent playoff hole after her bogey-free, final-round 68 . Although she cried with joy on the green for what she said was the first time in a U.S. tournament, her celebration was a bit muted because of the bizarre circumstances - at least until she made the traditional leap into Poppie's Pond with her caddie and friends. "It definitely feels a bit weird," said Ryu, who is expected to move to No. 2 in the world. "It was kind of a weird atmosphere, even after I won the tournament. "But I think the most important thing is no matter what happened during the round, we ended up going to a playoff. Then I was able to handle the tough situation well." Norway's Suzann Pettersen barely missed a birdie putt on the 18th to force a three-way playoff. She finished tied for third with Inbee Park and Minjee Lee. DIVOTS: Michelle Wie shot a final-round 69 and finished three shots off the lead in sixth place, her best finish in a major since she won the 2014 U.S. Women's Open. ... Cristie Kerr finished seventh for her best performance in a major since the 2014 event here, when the tournament was known as the Kraft Nabisco Championship. ... World No. 1 Lydia Ko finished in a tie for 11th at 7-under 281.